"A bounteous miracle that makes you feel that past time, and our time, differently; everything becomes freshly energized, infused with humanity, vital, sad, and full of importance. To see the world through Egan’s eyes is to be moved, through language, to new adoration of the world. I don’t know a better writer working today. There is a generosity in her prose that is vastly enlivening to its reader and brings about that beautiful effect fiction sometimes causes: more, and better-grounded, fondness for reality, just as it is." "Manhattan Beach is so rich in detail and atmosphere; such an exploration of underworlds of all kinds, filled with lessons on lifelines and buoyancy and how to bear life’s weight by diving deep into it. 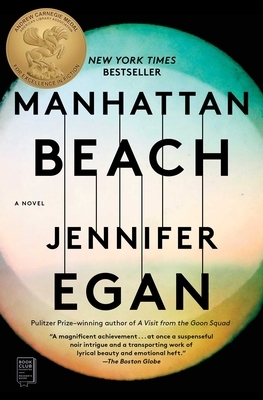 Jennifer Egan has masterfully conjured an era we are on the cusp of losing. Her novel is an absorbing story, beautifully written. Its strands of subtle intrigue and quiet heroism make you reluctant to leave each page while eager to get to the next." "A novel that deserves to join the canon of New York stories." "Highly atmospheric... immediate... expertly written"